UNIVERSAL. The app is suitable for all age groups and skill levels. You can be a beginner, intermediate or advanced typist. 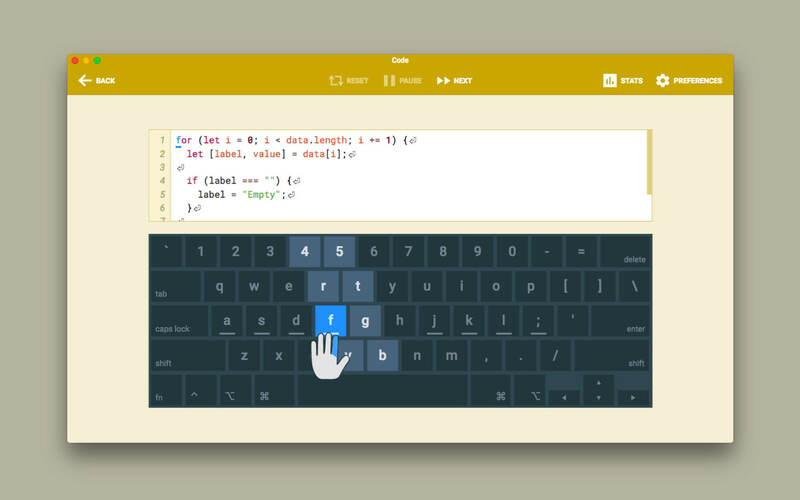 Even if you took typing classes before, but it never sank in, Type Fu will help you refresh your skills and take them to the next stage instantly. PACKED WITH ENGAGING EXERCISES. Type Fu is fun to use! Lessons vary from simple letters, numbers and words to proverbs and quotes of great thinkers of the past. Basic lessons (letters, numbers, words) are generated programatically so that you will never see the same exercise twice. MULTIPLE LEVELS OF DIFFICULTY. Should you start from the very beginning, or do you want to just polish your type-fu a tad? Figure out your initial skill level and start practicing right away, until your fingers are a blur! MULTIPLE KEYBOARD LAYOUTS. English language users can choose between following layouts: Qwerty, Dvorak, Colemak, Workman, Norman, Qwertz, Azerty. German language users can choose between: German Qwertz and Swiss Qwertz layouts. ADAPTIVE. Type Fu is smart: when you are making an outstanding progress, it can automatically increase the level of difficulty to keep you on your toes while improving the skill. VISUAL AND AUDIO HINTS. Type Fu assists in a non-obtrusive way. Various indications of hitting or missing the right keys are helpful, pertinent, don't get in the way and can be disabled. EASY PROGRESS TRACKING. 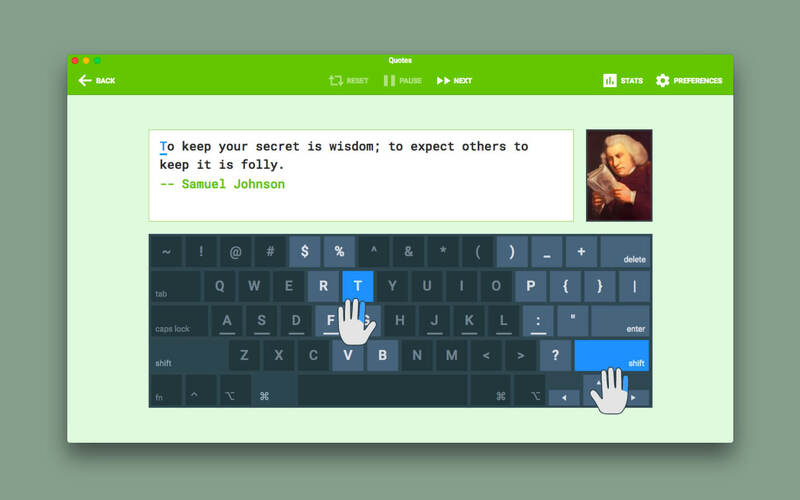 Type Fu helps you perfecting the skill of touch typing by visualizing your progress. 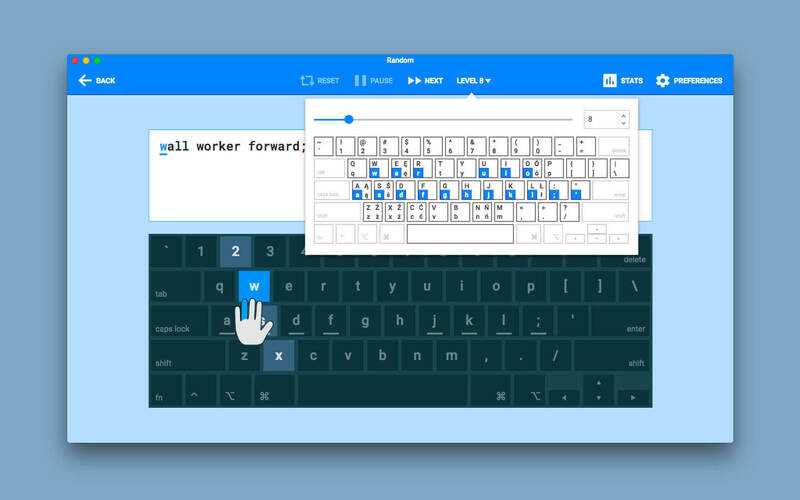 You will be able to easily tell from the pretty charts exactly how much better your typing speed and accuracy become, and which keys your miss most. FULLY INTEGRATED WITH YOUR MAC. Get the top-notch user experience offered by Mac computers. Type Fu supports Retina displays, process sandboxing, automatic updates via Mac App Store and full-screen mode.